If you're often away from home and need to find some way to feed your pet at the right times and with the right foods, you might want to consider getting a Wi-Fi supporting smart pet feeder. Smart pet feeders can be scheduled to dispense food for your pet when you're away, and they can also be used to dispense remotely extra meals to your pet in real time using your smartphone or tablet. These pet feeders come with various features depending on the brand chosen. Some also have built-in cameras so you can see your pet remotely, others allow recording of your voice so the feeder calls your pet to eat when feeding time arrives. They can also send alerts and notifications to your smartphone or tablet, to inform you of events and problems at the feeder end. To properly install a smart pet feeder, you will need of course a Wi-Fi router installed at your home and access to internet. These smart feeders are usually easily connected to your home's Wi-Fi and to internet, if you follow the provided instructions. This article will compare Petnet and Feed and Go Wi-Fi Smart Pet Feeders. These were not just the most popular among Amazon customers at the time of this writing, but they had also received mostly good reviews from Amazon buyers. Selected WiFi Smart Pet Feeders on Amazon. Both pet feeders support Wi-Fi connectivity. As long as the camera is connected to your home's Wi-Fi, your smartphone or tablet could be anywhere and connected either via Wi-Fi or 4G LTE. 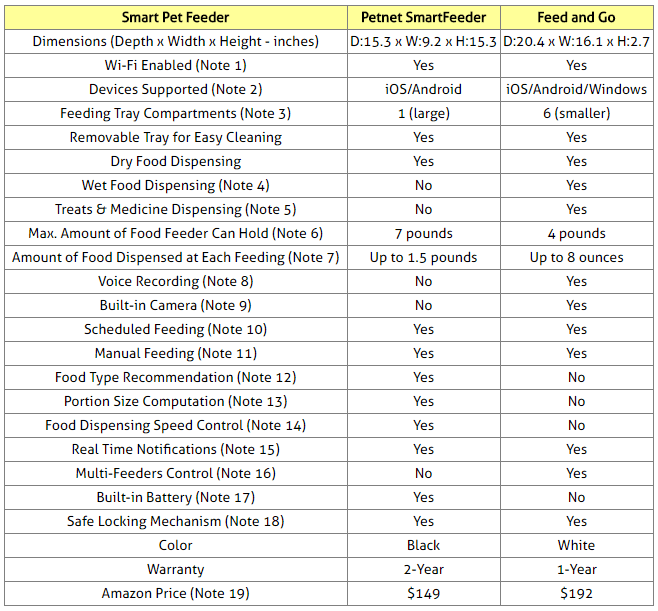 Note that while both of these smart feeders can be controlled from your smartphone and tablet, Feed and Go can also be controlled from your computer/laptop. Because Feed and Go also supports Windows, it can be controlled not just from a smartphone or tablet, but also from your desk top computer and laptop. Feed and Go tray has 6 built-in slots (or compartments) 5 of which are covered at any one time. The slots can be loaded with both dry and wet foods, treats and medicine as needed. Each slot of the tray has 8 ounce capacity, for a grand total of 4 pounds of food in the tray. The 6 slots/compartments are shown in the above picture. One cannot specify using the App which compartment will contain which type of item. When a scheduled feeding occurs, the tray rotates counterclockwise, one slot at a time, to expose the slot that was to the left of the exposed compartment. So, to manage timely feedings for your pet, you first need to create the order in which items such as food, treats or medicine are to be presented to the pet in terms of timeline, and then place those items in order, in a clockwise manner, starting with the covered slot to the left of the exposed compartment. Then, you create the corresponding feeding schedule on-line using the App. Most automatic pet feeders work with dry food, but not with wet food. Feed and Go is one that can also feed wet food. It is equipped with a motor strong enough to turn the tray that holds the wet food, and the food is kept fresh because when the top is closed, only one slot is on display. The amount of time that the wet food stays fresh depends on the type of food and the ambient temperature where you live. The feeder keeps the wet food sealed air tight, but does not keep it cold. Therefore, it is not recommended to leave wet food in the feeder for longer than 24 hours. Because the tray Feed and Go is equipped with has 6 slots, any slot can be selected for feeding food and treats, or even medicine if required. The tray rotates counterclockwise, one slot for each designated feeding time. You just need to place the various items to be dispensed into the right slots, depending on the order they will be fed to the pet (as described in Note 3 above). The Petnet SmartFeeder hopper can hold from 5 to 7 pounds of food. It must be dry food from 1/8” to 5/8” in diameter. The Feed and Go tray has 6 built-in slots and each slot has a capacity of 8 oz. Therefore, the feeder can be loaded for a grand total of 48 ounces (or 4 pounds) of food. Feed and Go has a tray that has six slots and each can take up to 8-ounce of foods. Therefore, the maximum portion for a particular feeding is 8 ounces. If your pet needs more than 8 ounce, you can schedule two or more consecutive feedings 5 minutes apart (or however long you need them to be apart). Note that many customers have found that, for those pets that need more than 8 ounce of food at each feeding, dispensing the food at 5-minute intervals to be very beneficial, as it prevents the pet from eating too much food all at once and subsequently feel bad and even vomit. Feed and Go is equipped with a voice recording system to record your own voice and personal message that your pet will hear when feeding time comes. You can play your voice into the feeder, so that when your pet needs to be fed, or when you just want to call your pet over to make sure all is fine, it’ll be your voice that the pet hears. You can record a message up to 6 seconds long, and if you’re not happy, you can erase and do it again. Feed and Go is equipped with a built-in high quality webcam so you can see your pet while you’re away from home and while feeding. Feed and Go gives you multiple options to set up numerous regular feeding schedules which will run continuously until you change them. In particular, you can schedule multiple feedings for the same day at different times. If you prefer, you can also schedule one-time feeds just for certain days and certain times. Using the App you can change the schedules anytime. Petnet SmartFeeder allows to schedule one feeding at the same time for everyday of the week (you can’t schedule different times for different days of the week). Using the App you can change the schedule anytime. If you want to feed your pet remotely and manually without using any schedules, or if you want to feed your pet extra meals over and above what is programmed by the schedule, both feeders allow manual real time "feed now" type action using their respective Apps. If you don’t know what’s the best food for your pet, Petnet SmartFeeder will suggest the best food for your pet based on your pet's breed, age, weight, and level of activity. It accesses a large database of pet foods to find the right food for you pet. You can also order the food through the App and it will be delivered to your home. Petnet SmartFeeder computes the right amount of portion based on your pet's breed, age, weight, and level of activity, so you can ensure your pet is eating the right amount of food every time. No more guessing how much food to give. It dispenses between 1/16 and 1.5 cups depending on your pet’s specifics. Of course, you can modify the portion size at anytime using the App. Petnet SmartFeeder allows you to select how fast the food will be dispensed. Slowing down the food dispensing speed is quite useful in cases where the pet tends to eat too fast and then feels sick and vomits. Feed and Go sends real time notifications to your smartphone/tablet/computer when your pet is about to be fed and after your pet has finished eating. 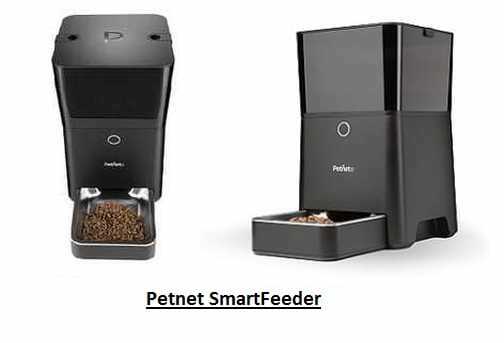 Petnet SmartFeeder also sends alerts to your smartphone or tablet to inform you on food levels in the hopper, successful feeds, battery status, and when the feeder is disconnected from internet. When you receive an alert saying that food level in the hopper is low, you can order the food through the App, and it will be delivered to your home. Got more than one pet? You can control unlimited Feed and Go smart feeders from one profile with one simple press of a button. Though both smart feeders need to be connected to an AC outlet with the provided AC adapter, Petnet SmartFeeder is also equipped with a built-in rechargeable lithium battery in case of power outage. A micro USB cable is included with Petnet SmartFeeder for easy recharging the battery. Both smart feeders are equipped with a safe locking mechanism that makes it impossible for a cat to temper with the unit. So which Smart Pet Feeder to buy? Though both pet feeders considered here are no-doubt high quality products as can be concluded from the mostly positive reviews written by Amazon customers, they are quite different. Yes, they both allow you to schedule feedings of your pet when you're away and feed the pet remotely in real time if needed. But aside from that, they come with very different features as shown in the comparison table above. Feed and Go has a built-in camera so you can see remotely your pet. Feed and Go allows recording your voice, so when feeding time comes, the pet is called to eat by your familiar voice. Feed and Go allows serving your pet safely wet food. Feed and Go has a tray with multiple compartments (slots), so you can even serve different foods, treats and medicine if required. Feed and Go allows scheduling multiple feedings for the same day. You might need one feeding for the meal, and then later another for some treats or some medicine, if needed. But with Petnet SmartFeeder, you can only schedule one feeding per day. Feed and Go allows control of multiple feeders from the same App, a feature useful if you have more than one pet. Petnet SmartFeeder has a built-in rechargeable battery that will keep the unit working even if there is power outage. Petnet SmartFeeder App will recommend the right type of food based on your pet's characteristcs. Petnet SmartFeeder App will compute the right portion of food you should dispense based on your pet's characterisics. Petnet SmartFeeder allows ordering via the App additional food when there is no more food left. Petnet SmartFeeder comes with a 2-year warranty instead of 1-year for Feed and Go. So, before you select one of these smart pet feeders, you should carefully consider the above summarized feature differences and see which are more important for you to have. Please click the Pet Feeder of your choice below for price information or to purchase. - You can schedule up to 12 meals a day with flexible meal portions from 1/8 cup up to 4 cups. - It is equipped with an anti-jam conveyor system that can dispense both dry and semi-moist foods of different shapes and sizes. Immediate Feed Mode dispenses next scheduled meal instantly. Pause Feed Mode temporarily stops feeding without losing the programmed feeding schedule. - It has a pet-proof dispenser helps keep out prying paws and a locking lid that helps keep food fresh and secure.